I didn’t actually spend much time photographing the ceremony, but I did attend it this year. Due to wind and threat of rain, the event was moved to the capitol’s Memorial Hall instead of outside at the monument on the east side of the J-Wing. The video is in HD if you click through to watch it on YouTube. 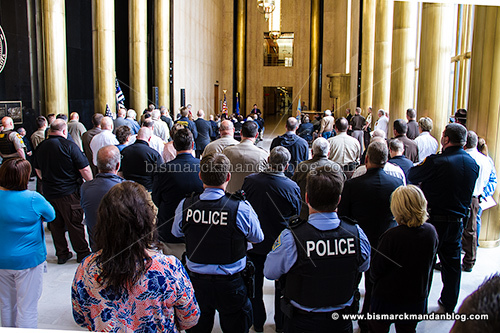 This is a somber event, and one that I hope will get a lot more attention now that the community has gone through a major event with law enforcement and pro-LE sentiment seem to be at an all time high. Our community honors our heroes.